This canvas looks just as it does online very beautiful and well made. It gives that pop that you need when your trying to make something stand out. The flower is not over barren at all. Just gorgeous with a great price. 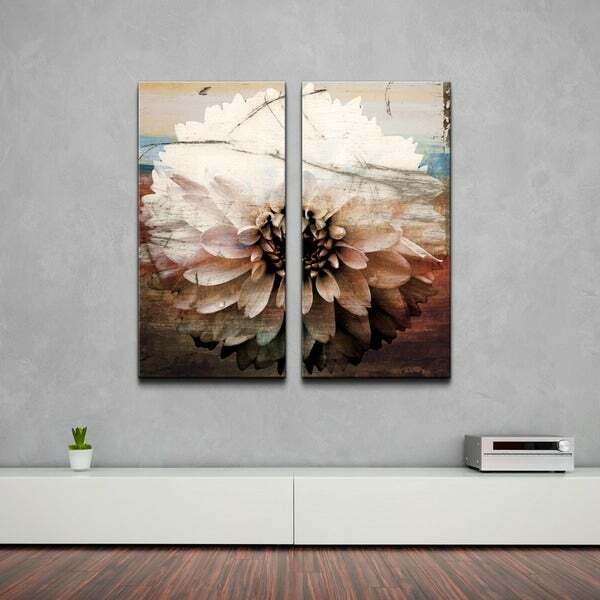 Show off your artistic side with this two-piece Ready2HangArt wall art. Ideal for a large lobby or expansive living room wall, this contemporary art piece features a soft blue, rose, gold, brown and ivory color palette. This detailed floral study makes a dramatic impact whether paired with streamlined modern furnishings, mounted behind a shabby chic sofa or positioned between a pair of delicate vintage chairs. This appealing piece of wall decor will reinvigorate your home. Made in the USA from US and imported parts. The colors are true to the online picture. Very nice quality. Light weight, with a picture hanger on the back of each piece. Easy to hang, and looks great! I fell in love with this piece of art when I found it online! I received it in the mail in no time and looks just like what I expected. The only reason I didn't give this 5 stars is because there was some rippling in the canvas up top. It seems like it needs to be stretched more. You can barely tell though. So it still looks great in my dining room. Absolutely stunning piece of art! Could not be happier! This piece looks great over our sectional couch and matches nicely with the room colors. I love it! These pictures are very nice and go well with our modern rustic decor. The colors are very beautiful together. They are substantial on the wall as well. I have this canvas above my fireplace, surely makes a beautiful statement! The quality of the art is gorgeous! The colors are as described and fits perfectly in my apartment! This wall hanging hanging is dull and boring. I returned it immediately. i should have paid more attention to the other reviews. I absolutely fell in love when i saw this picture and wasn't disappointed when I received it. It goes GREAT in my family room adorning a wide wall. Though, I must admit, I hated paying so much...but I guess a girl deserves a splurge every once in a while. Packaged for shipment nicely. Style-wise I just don't know if i love it in the room. Maybe it will grow on me? The colors are described on the website and do make a statement to any space. I also like the weight for the size and it’s easy to hang. I also like the option to separate or keep the together. Great product. Loved it ! Bought this for my condo hallway to put over my bench...looks beautiful! "Why do you not allow people to post pictures of things they purchased? I think you would sell more items especially higher priced items like this. I would love to purchase but am scared of not being happy with the price. Can someone please tell me if these pictures look exactly as shown and if not what is different? I do not understand why the dimensions are so much wider than the height even though the picture looks opposite. Thank you "
THE ACTUAL HANGING IS VERY DULL - NOTHING VIBRANT OR APPEALING AT ALL. I RETURNED IT. "Is the detention of this item 20x40 each or together"
"The dimensions don't seem to make sense. Please confirm the L and W of each panel." Hello moniob, the correct overall dimensions are 40 inches high x 40 inches wide x 2 inches deep. This makes each panel 40 inches high x 20 inches wide. I hope this helps. Thank you for shopping with us!